Rich chocolate aroma with a hint of smoke. Creamy texture combines caramel and chocolate flavours finishing dry with bitterness from the dark malts and hops. 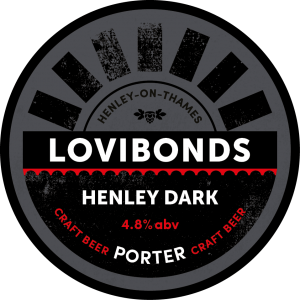 Henley Dark is inspired by 18th century London Porter and is crafted with a blend of seven different malted barleys including one smoked with beech wood. Deep amber with a ruby glow and creamy tan head. Try Henley Dark with a char-grilled steak or a sweet dessert to appreciate the chocolate flavours from the dark malts.